Part Used : Roots, Fruits, Flowers And Leaves. Habitat : It is scattered at an altitude of 5,000 ft. in deciduous forests of india and andamans. Uses : The roots are bitter, sweet, pungent, anodyne, demulcent, lactagogue, refrigerant, stomachic, galactogogue, laxative, anthelmintic, anti-inflammatory and tonic. The roots alleviate vata and kapha, have hot potency and heavy attribute. It is used against anthrax, bilious disorders, bites, blood disorders, cholera, colic, convulsions, diarrhea, dropsy, epilepsy, fever, gout, headache, intoxication, rheumatism, sore throat, burning sensations, and snakebite. The root decoction is used for abdominal tumors. Fruits are sweet, alternative, aphrodisiac, astringent, diuretic and tonic. The fruit alleviates pitta dosa and possesses heavy and oily attributes. Fruits are used for heart diseases, leprosy, vomiting and burning sensations. Flowers are sweet, cooling, bitter, acrid and astringent. They are useful in leprosy and blood diseases. 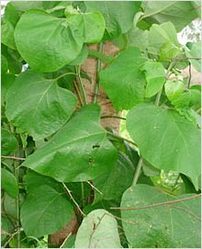 Paste of leaves used in fever, headache and in burning sensations. Root and Bark are useful in hallucination, piles, abdominal pains, burning sensations, fevers, 'tridosha' and urinary discharge. Leaf paste is applied to relieve headache and juice is used as wash for ulcers.